I think this has become my favorite Ritrovato key image. 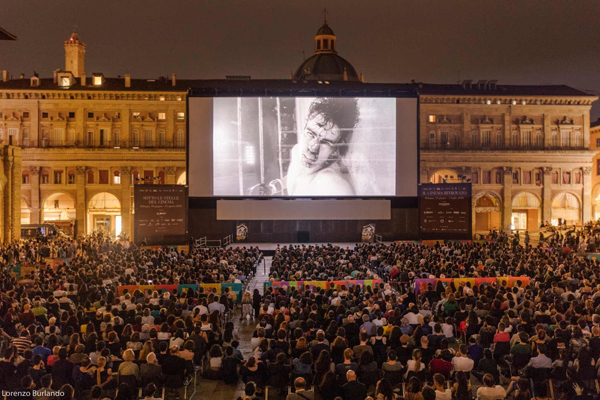 Cinema Ritrovato rolls on, leaving your obedient servant little time to blog. Herewith some quick impressions on a thin slice of all that’s going on. For a full schedule of this incredible event, go here. “Not all IB Tech prints are created equal,” explained Academy Film Archivist (and UW–Madison grad) Mike Pogorzelski. 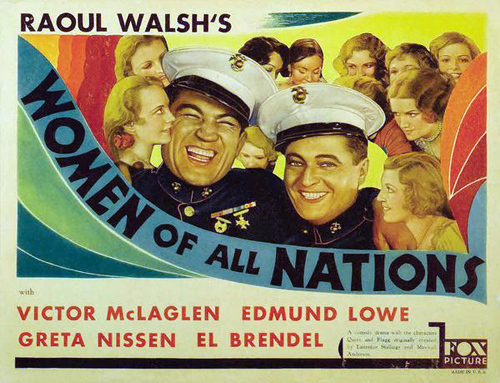 In his last of his annual Technicolor Reference Print shows, he pointed out that Technicolor sent its best-balanced prints to big-city venues and circulated them widely. As a result, they got worn out. The prints most likely to survive were less-than-perfect ones sent to the hinterlands or just kept as backups. Hence the need to preserve the Reference Prints selected by the filmmakers as defining the Technicolor timbre of each film. 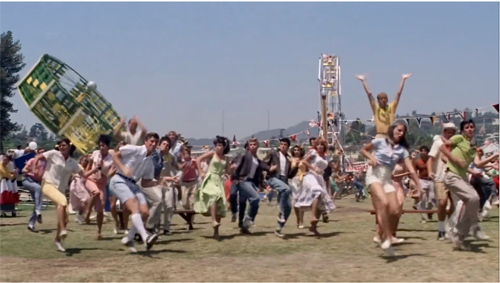 With clips ranging from The Godfather and Let It Be to Sssss and Billy Jack, the sample gave a good sense of what Tech looked like a few years before the imbibition (IB) process was abandoned in 1974. Mike and Emily Carman introduced the extracts with informative commentary. I had always thought that Gordon Willis’s cinematography on the Godfather films and The Parallax View increased graininess, and this show seemed to confirm that sense. William Dieterle’s Germanic Six Hours to Live (1932) begins as a political thriller and devolves into a Twilight Zone fantasy. A representative of a small country passionately protests worldwide tariff legislation. To keep his vote from vetoing the action, spies target him for elimination. Soon enough, he’s throttled to death. But an enterprising scientist takes the opportunity to try out his resuscitation ray, which gives the hero a few more hours to make his mark. John Seitz photographed the whole farrago in glowing imagery shot through with shafts of blackness, alternately soft-focus and crisply edged. Here’s the magic machine. 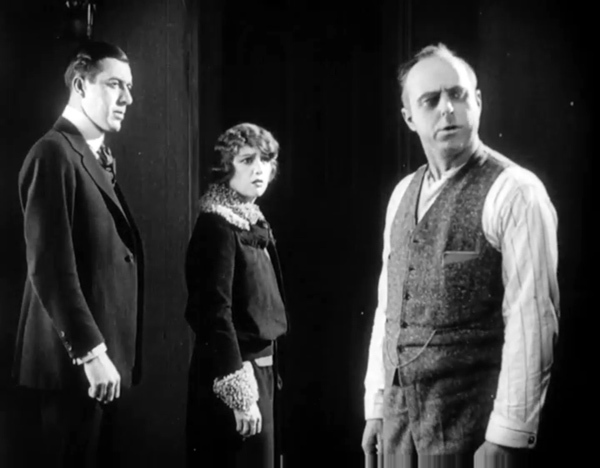 The film’s look is an example, I suppose, of what Andrew Sarris once called “Foxphorescence”–the signature of a studio that, from Murnau and Borzage to Ford and 1940s noirs, played host to dazzling pictorial effects. 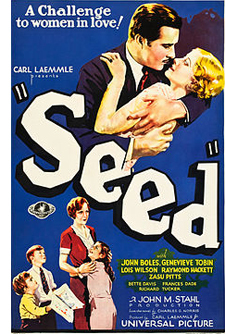 Not completely naughty, but certainly a film about sexual jealousy, was Seed (1931), one of the most anticipated films of the Stahl cycle. It lived up to its reputation as a masterly orchestration of sympathies. At the center is a love triangle based on two women’s roles: the mother and the businesswoman. Aspiring author Bart Carter has given up his novel, and he lives–he thinks–happily with his wife Peggy and five rambunctious kids. When his old flame Mildred returns to the publishing firm Bart works for, she encourages him to keep writing and to stray from the household Peggy has made for him. As often happens in Hollywood, the plot works only if the man is a jerk, and the action will set up things to make the woman take the blame. Mildred may not have schemed to pull Bart away from the start, but the shift in our sympathy to Peggy is pretty decisive. The film’s patient pace and stringently objective presentation lets contrasting feelings get developed gradually. The kids, particularly the whining runt of the litter, are annoying and troublesome. Mildred is no obvious predator, Peggy is trying valiantly to accommodate Bart’s ambition, and he’s enjoying his vacation from fatherhood while still struggling, albeit weakly, to stay loyal to his family. Stahl was one of the major long-take directors of 1930s Hollywood, and Seed is exemplary in this respect. (The average shot lasts about twenty seconds.) His back-to-basics two shots, facing off characters in profile, become the default setting; there are scarcely any reverse angles or eyeline matches. This apparently simple creative choice, anticipating Preminger’s method of the 1940s and 1950s, puts all characters on an equal footing. The framings force us to concentrate on their conversation, avoiding the customary cuts that punch up particular lines or reactions. A similar steady observation is at work in Stahl’s fine Imitation of Life (1934) and Magnificent Obsession (1936). 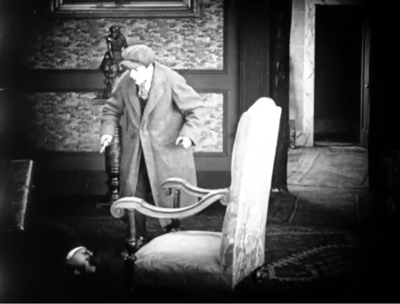 Regular readers of this blog know that one area of my research is the stylistics of 1910s cinema in various countries. (Check the category tableau staging for a sample.) 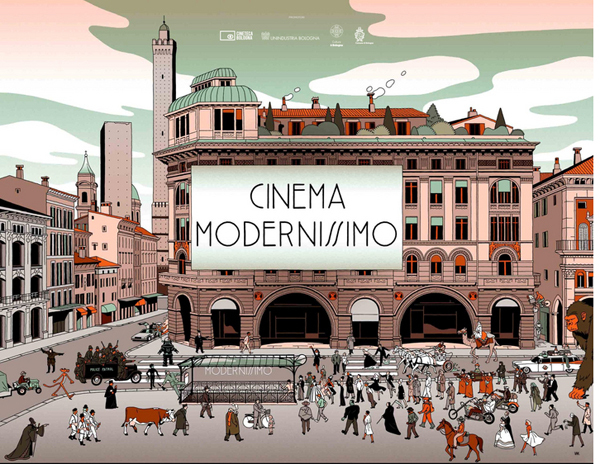 Naturally I dropped obsessively in on the 100-years-ago strands at this year’s Bologna. 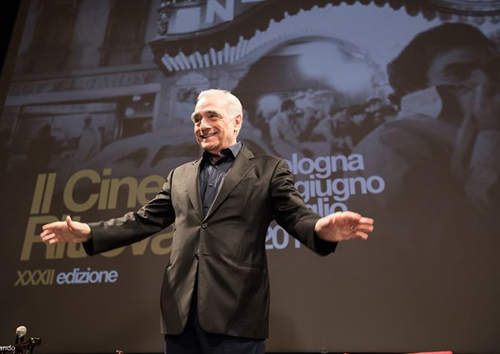 While there are more films to come, I found plenty to enjoy and think about in the first few days. 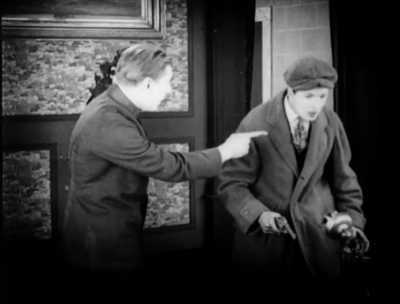 There was, for instance, Der Fall Rosentopf, a fragment of a farcical Lubitsch feature. Ernst plays his Sally character, now a detective investigating a flower-pot mystery. Lively enough, the surviving nineteen minutes from early scenes didn’t give me much sense of the whole. Alongside it were two other comedies. 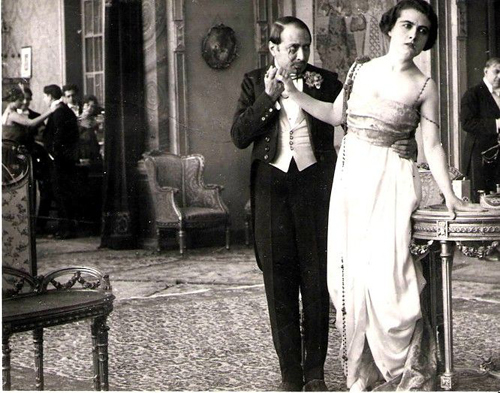 Gräfin Küchenfee featured Henny Porten in a dual role, both countess and kitchenmaid. When the countess goes off to have fun, the maid assumes her identity. Eventually, the two women switch roles when the countess tries to evade police charges by pretending to be the maid. No less predictable in its comic situation was Puppchen, in which a young woman working in a fashion salon breaks a lifelike mannequin and must take its place. 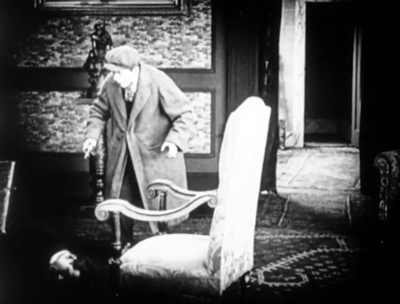 It may have been a model for Lubitsch’s Die Puppe (1919). Stylistically, all these films were fairly staid, with little intricate staging, and they lacked analytical editing apart from axial cuts in and out. Their reliance on longish takes probably reflected the fact that US films, with their bold continuity editing, weren’t available in Germany until somewhat later. One American film also rejected the emerging Hollywood style, in the name of naivete and fancy. That was Prunella by Maurice Tourneur. It doesn’t survive complete, and it’s been known for many years as a failed venture into artiness. The flat sets resemble children’s book illustrations, and the performance style is wilfully arch. I’ve never found Prunella very interesting, but it does offer further evidence that the 1910s harbored some eccentric and ambitious experiments. Gustavo Serena’s L’Avarizia impressed me more. It too relies on frontal acting and axial cutting, but as a vehicle for the great diva Francesca Bertini it seemed to me completely engrossing. As part of a series illustrating the Seven Deadly Sins, it offers a starkly symmetrical plot. Maria and Luigi love each other, but each is dominated by an old miser. Her aunt and his father each amass a fortune in secret while manipulating the young people. Through a series of conspiracies and misunderstandings, the lovers are flung apart. Maria, friendless and illiterate, sinks down, down into the bottom of society. Each step of the way is given powerful expression by Bertini’s face, gestures, and bearing. She grabs her hair to yank her head back; she blows cigarette smoke in Luigi’s face to show her contempt for his abandonment of her. At one high point, when Luigi falsely accuses her of infidelity, she wrestles with him on a tabletop, giving no quarter. In a tavern fight she pulls a knife before falling to the floor, writhing feverishly in what appears to be her last moments on earth. This is silent opera, with the soaring melody carried by the body. A meeting of the Antifeminist Club (The Oriental Language Teacher). 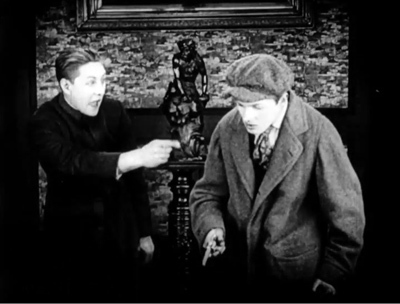 I wasn’t surprised to find a diva film full of sensuous appeals, but the big revelation of the 1918 cycle so far was the Czech comedy The Oriental Language Teacher (Učitel Orientálních Jazykû). It showed what you could do with a small cast, a few sets, and a cut-and-dried situation. Sylva secretly falls in love with Algeri, who’s tutoring her in Turkish. After her father is being considered for a diplomatic post in Turkey, he decides to learn the language. He arrives during one of Sylva’s lessons, so she quickly disguises herself as an odalisque. Needless to say, Father is smitten with this exotic beauty. Add in his membership in the Antifeminist Club, led by a comic geezer who enjoys snapping clandestine photos of passing women, and insert deceptions involving a pianola roll, and you have some substantial complications. 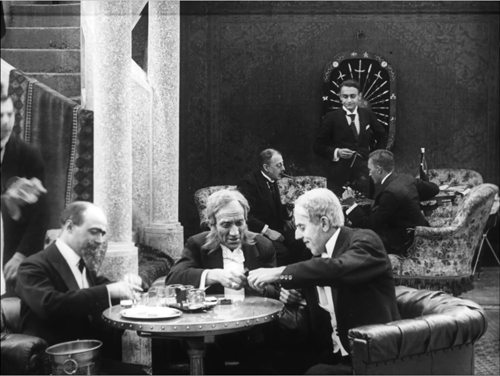 Most striking from a pictorial standpoint were the very deep sets–modeled, stylistic historian Radomir Kokes tells me, on the Danish cinema of the period. 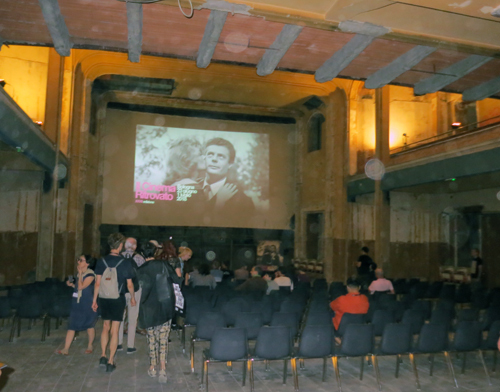 The co-directors Olga Rautenkransovå and Jan S. Kolár present Sylva’s parlor in an unusual way. 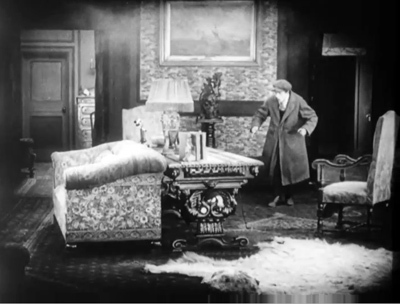 Most films of the period put foreground desks and tables at a diagonal bias. But here the father’s desk is thrust very close to us, perpendicular to the camera, and it runs the entire length of the frame. Moreover, the father is centered at his desk, when the more normal placement would set him to left or right and clear a space in the other half of the frame for other characters. The depth, that is, is typically horizontal. Here, though, it’s also vertical. A character must descend the stair directly above the other, in a maniacally centered composition that’s mildly beguiling in itself. 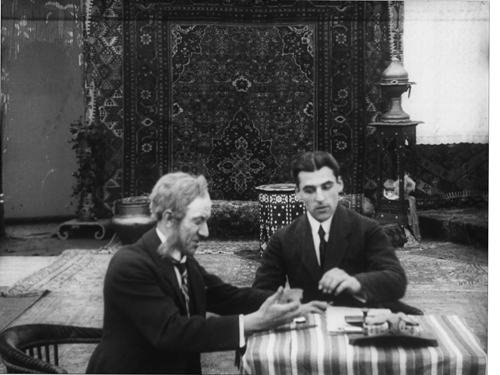 The set depicting Algeri’s studio is a little more typical of the period, since his desk is placed off to one side, but every shot of this setup makes the foreground area curiously out of focus. 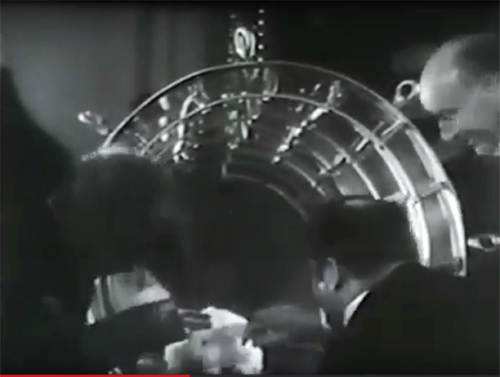 Given that the control of focus is precise in the parlor shots, the slightly fuzzy foreground of the studio set remains anomalous–an error, or a decision to differentiate the two spaces more sharply. In any case, here’s another example of how 1910s movies, from all corners of the world, can set you thinking about the possibilities of pictorial design. More to come in the next entry, with a special focus on trial films. Special thanks to Radomir Kokes for help with this entry. 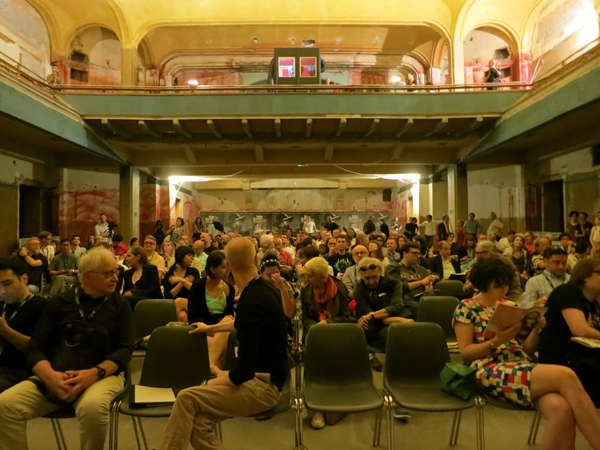 More generally, thanks to the Bologna leaders and staff for a tightly-run and ever-exciting event, along with the archivists who made these films available. In particular we owe a lot to Marianne Lewinsky, who curates the Cento Anni Fa series, and to Dave Kehr who, grinning, shares what he called on the first day MoMA’s “mildly obscure” treats. And Imogen Sara Smith gave an exceptionally lucid introduction to Seed. For more on diva acting, see Ben Brewster and Lea Jacobs, Theatre to Cinema, a book available here, and this entry by Lea on Bertini. Kristin wrote about Prunella and other mildly experimental Hollywood films in Jan-Christopher Horak’s Lovers of Cinema collection. For more on-the-spot pictures, check our new Instagram page. 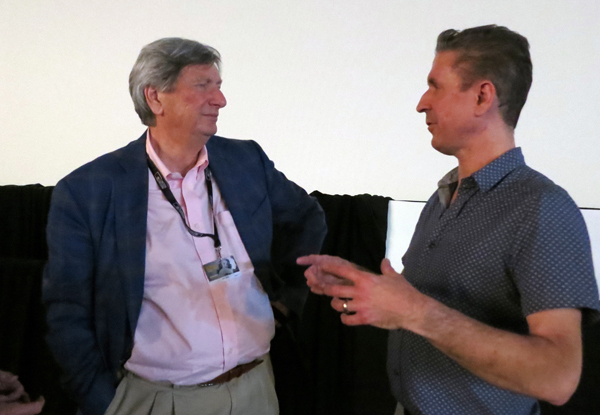 John Bailey, President of the Academy of Motion Picture Arts and Sciences, and Michael Pogorzelski. Photo: JERRY LARA / San Antonio Express-News. Should there be any doubts that the US is moving toward a fascist coup, events of the last two weeks should have dispelled them. Trump broke with our European and North American allies. He reconfirmed his loyalty to Putin and Kim. He launched an international tariff war. And now he and his Gauleiters Jeff Sessions and Stephen Miller have created, more or less in the open, concentration camps for children. What has held back the tide of full-blown fascism? The media, elite or grassroots, have done their duty with surprising vigor. I noted last year that reporters were starting to spotlight the lies of the Trump administration, and now even the gray old Times ventures a “falsely” or two. Without the leaks, analyses, and exposés, we wouldn’t know about the camps, the scandals, the moral vacuity of Congressional Republicans, the dissolution of regulations on corporations, the palace intrigues of corrupt advisers, and the depredations of a president™ elected by a margin of 77,000 imbeciles’ votes. The courts, at least those not yet supervised by Trump appointees, have pushed back as well. In tandem, the Mueller investigation plows methodically on, bringing to light a cast of characters whose intellectual endowment makes the wise guys in Gotti look like particle physicists. Still, the Base (well-named) is getting a new reality show. Trump campaigned by winning every day’s news cycle; he provoked coverage and reaction, which allowed him to holler back, raise the stakes, and keep everything going. The immigration drama is the new main attraction. Many will glory in watching the stupendous power of the US being inflicted on toddlers and mothers in blazing heat. The Base embraced Trump for “telling it like it is”–that is, venting the vileness that minimal civil courtesy kept in check. But they’re not deep thinkers. One could tell the Base that there’s a difference between asylum and illegal immigration, and that crossing the border without permission, legally speaking, is a misdemeanor comparable to a traffic ticket. 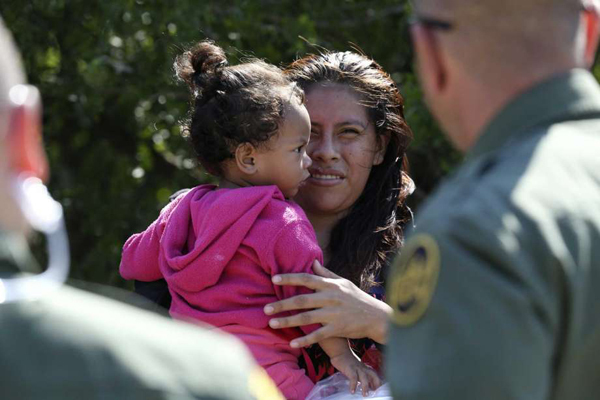 One wonders if the Base even recognize the difference between legal and illegal immigration. In addition, huge sectors of the economy (agribusiness, construction, meat packing, hoteliery) depend on immigrant workers, including illegals, willing to perform jobs that the Base prefers to avoid, at least at the wages offered by cynical employers. But informing the Base about such nuances would run against the grand plan to homogenize our country–and expand the Base. Trump is the culmination of Republican conservatism from Goldwater to Reagan to Gingrich, intensified by the Tea Party franchise. The proof lies in Trump’s easy victory over his rivals and his swift takeover of Congress. Similarly, the dithering of the Democrats is a direct result of their shift toward defending the urban meritocracy of Wall Street and Silicon Valley. (On this, Thomas Frank’s Listen Liberal is the essential text.) That bias found its initial focus in the Clinton regime, and it was continued by Obama. One beguiling sideshow of recent weeks was the reappearance of Bill, talking about the Lewinsky affair and revealing himself, once again, as devoid of any scrap of personal honor. I’d like to be more hopeful. It’s possible that Sessions, Miller, and Trump have overplayed their hand. Even some Bible thumpers have drawn the line at wailing children, and the hicks are starting to notice that they need immigrant labor and that tax cuts don’t offset trade wars. Some voters may realize that Trump and the Republicans want to take away favored stretches of the Affordable Care Act. Trump has counterpunched on the immigrant issue, but he may well find a way to back down while declaring victory. As I type this, Senate Republicans are engaged in damage control.…at the very moment that they propose cutting Social Security, Medicare, and Medicaid to pay for the income tax cuts. Perhaps the base will notice. But don’t bet on it. Overall support for Trump is solid, perhaps swelling, and not just among his core, the gun fondlers and the white supremacists. CEOs like the deregulation, the holy rollers favor humans in fetus form, the exurbanites savor the punishing of the people who were the reason they feared the city, and the peckerwoods just like to chortle at liberal outrage. 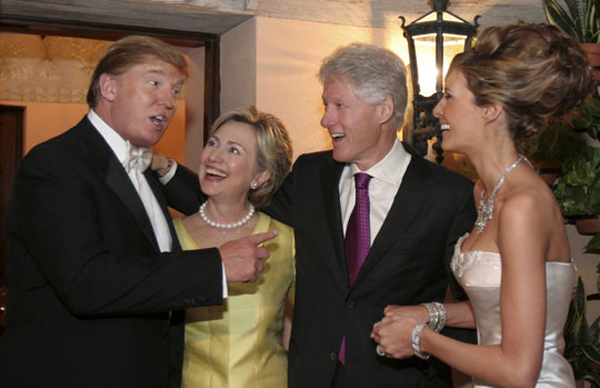 Quite a coalition. Indeed, you could treat the border crisis as a massive get-out-the-vote effort aimed at that mob. Like what you see? Vote Republican! Moreover, the increasing authoritarianism of Trump’s demeanor suggests that each day brings a new power grab. He will likely be boosted by a passive Republican congress and Democrats who are perpetually concerned, disturbed, and brow-furrowed but never, somehow, furious. So we can’t assume that he won’t keep trying to expand on his brutal impulses. (1) Trump continues to show himself a coward. When he met with Mexico’s president during the campaign, he didn’t dare to raise the demand for a wall. Meeting dictators in the Middle East and Asia, he bowed and scraped. 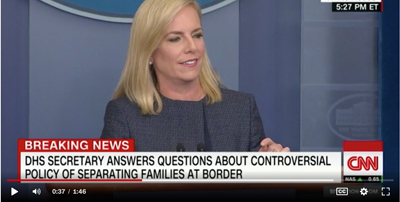 Now, flexing his muscle on kids, he and his minions tell half-a-dozen different stories about the HHS policy rationale and deploy John Kelly’s puppet Homeland Security Secretary Kirstjen Nielsen (above) to fend off the press with smirking lies. Trump himself will not confront his critics, playing only to Fox News toadies and multitudes of simpletons jammed into rallies. (2) 2016 was, we now realize, an outsider election. Bernie could have won. But even if he had lost, wouldn’t it have been worth the risk? Some anecdotal confirmation that this round-the-clock spectacle is exactly what the White House wants comes in this Vanity Fair piece. Predictably, Stephen Miller is having the most fun of all. What pimply pre-teen would have imagined that de-pantsing little Stevie on the playground would have had such consequences?